Oleksandr Sulypa is Ukranian Grandmaster and famous trainer. 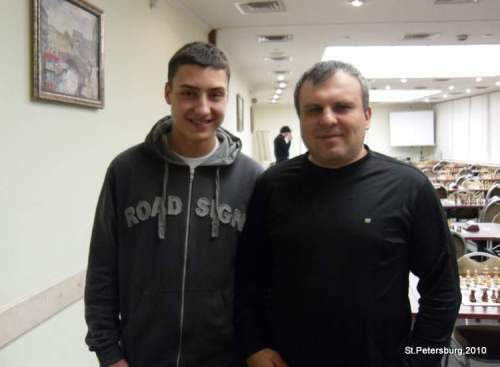 His student GM Dariusz Swiercz is a Polish chess star, bronze medalist from the 2010 World Juniors Chess Championships. 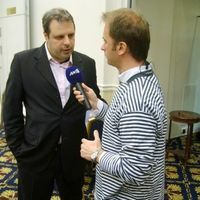 Interview performed by the Chessdom journalist IM Alexander Ipatov. 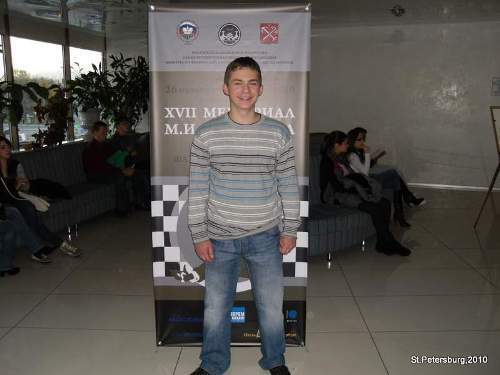 Alexander Ipatov: – What is your best achievements in chess so far? Oleksandr Sulypa: – I was Ukranian Junior Champion, and had won many international tournaments. From 1994 I started working as a coach. I became the coach of GM Vassily Ivanchuk and also acted as his second in super tournaments like Linares, Las Palmas, Novgorod. I worked with Vassily until 2001 and even now we are good friends. Ivanchuk isn’t only an elite Grandmaster, he’s a very nice and intelligent person. I was also the coach of the Ukranian National Team in the Chess Olympiad in Elista when we won a bronze medal. Dariusz Swiercz – My best achievement is the bronze medal in the WJCC U20, which was held in Poland in August 2010. I earned a GM title at the age of 14 years and 7 months. I’m a winner and co-winner of many international tournaments. A.I. – Oleksandr Sulypa, for how long have you been residing in Poland? O.S. – In Poland I’m staying since 2006. 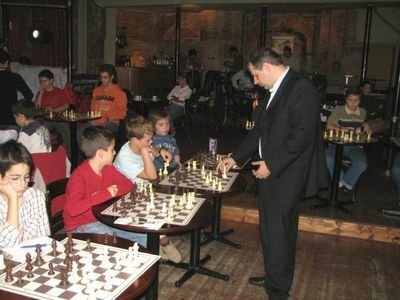 First I was working in the Chess Club “Polonia Wroclaw” and as a private coach as well. I am also the main coach of the Polish Olympic Chess Team for Women. A.I. – Do you like Poland? Do you want to come back to Ukraine? O.S. – Poland is a country which is developing at the moment. Chess isn’t so popular there as, for example, in Ukraine. Yes, I’m planning to come back to Ukraine in the near future. In Ukraine a Grandmaster is a favoured person because chess in Ukraine is recognized as sport. A.I. – What is your opinion about the organization of the Chigorin Memorial? What do you think about the accommodation and food in the Moskva hotel? O.S. – The tournament in St.Petersburg is organized on the top level. WGM Sudakova and Mr.Bykov are doing a great job. The hotel is very nice, Russian food is one of the most delicious in the world. We hope to play here in 2011 too. Frankly speaking, we should play in countries where chess is sport because it’s much better for raising the playing level. The chess in St.Petersburg is art. D.S. – The Chigorin Memorial is organized very well, I’m very grateful to organizers WGM Irina Sudakova and Mr.Bykov for inviting me to participate here. My coach GM Sulypa and me are accommodated in the Moskva hotel (4 stars) and the conditions are really wonderful! The food is very tasty. If the Chigorin Memorial will be organized next year, I would arrive to take a participation again. A.I. – What do you expect from your student GM Swiercz at the Chigorin Memorial? O.S. – Dariusz Swiercz is the youngest Grandmaster in Poland and a bronze medalist of the World Junior Chess Championship which was held in Poland this year. I’ll be following and improving his play. I will be helping him to prepare for the games as well. Meanwhile, in the rapid tournament of the Chigorin Memorial which finished a few days ago, I managed to win against GMs Dreev and Epishin. D.S. – The Chigorin Memorial is going to be a very strong event. In this tournament I’d like to get some experience and play really nice games against strong opponents. A.I. – What is the attitude of local people when they hear Ukrainian or Polish language? O.S. – Russians like foreign tourists. Their attitude towards us is very nice. D.S. – Russian people are very nice, I agree with my coach about that. We don’t have problems with communication because Polish language is quite similar to the Russian. By the way, I have started learning Russian because it’s very useful for chess players (e.g. to read Russian chess literature). A.I. – What are your plans in the future? The next tournaments? O.S. – I’m not playing much now, I go to the tournaments only as a coach. The next tournament of my students will be in December – the World Cup for Women 2010 where I’ll be helping Polish National Team. After that, I’m going to play in Bansko Open 2010. It has the organization on the top level, it’s a fabulous place from I saw on the photos and I also like skiing. D.S. – One weak after the Chigorin Memorial I’m going to play in the round robin tournament “Culture Village” in Netherlands. The tournament is a qualifier for the Tata Steel C Tournament. After that, I will play Blitz and Rapid European Chess Championship in Warsaw in December. A.I. 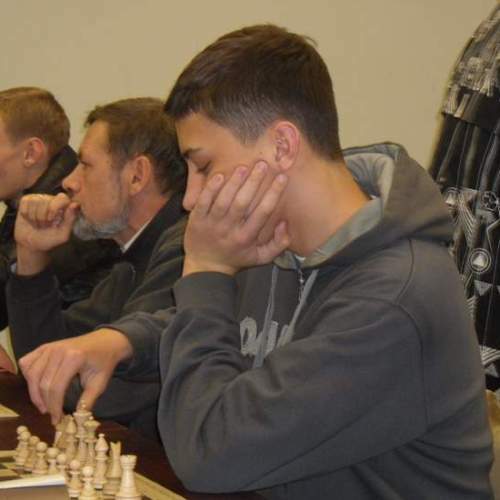 – What is your routine and the one of your students during the chess tournaments? O.S. – My philosophy in chess is hard training regime and discipline. Also I believe in deep preparation and good physical condition. D.S. – During the tournaments my coach and I are trying to go to sleep early. Also in my opinion the schedule of the professional chess player should contain preparation and outdoor walks to keep the brain fresh. After the game I relax by listening music and reading books. A.I. – Thank you very much for the nice talk Oleksandr and Dariusz! She is beautiful, smart, fun and, with very rare exceptions, would beat you, reader, in a chess game. We are talking about the WGM Natalia Andreevna Pogonina, 25 years old, who gave us the interview published below, inaugurating Radio Xadrez’s international franchise! 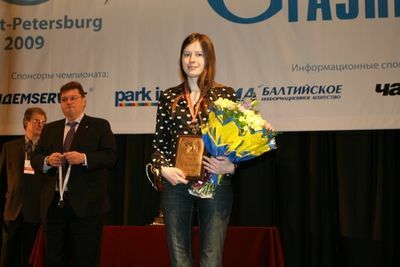 Resident of Saratov, in Russia, Pogonina was considered, in 2009 by the PCA, one of the three most successful chess players in the world. With 2.491 ELO-FIDE points on the September list (she’s had up to 2501), she defended the #1 board of Russia-2 in the Chess Olympics. Natalia (or Natalija) is usually remembered by her beauty and sympathy, qualities which are allied with excellent results on the boards. She is three-times European champion (U16, twice U18), bronze prize winner at the World Championship (U18) and European Women Championship, winner of the gold medal at the 1st International Mind Sports Games played in Beijing, China, in 2008, of which the Brazilian Alexandr Fier was also part. With more than 34 thousand followers on Twitter, a profile on Facebook and a site that’s updated almost daily, Pogonina stands out for her massive and solid actions for the sport. Married and the mother of 10 month old Nikolai, the WGM reserved some time in her schedule to talk to Radio Xadrez, a few days before she boarded to Khanty-Mansiysk, in Siberia. Radio Xadrez – First of all, we’d like to know: Have you always played chess exclusively or are you interested in any other sports? Looking through the pretty pictures on your website, we have a feeling that you could be a beautiful ice skater or an Olympic gymnast in Russia. Has it always been only chess? Natalia Pogonina – I am an avid sports fan and enjoy watching almost all types of sport broadcasts. Also love playing football, basketball, volleyball, skating and dancing. RX – We’ve always heard in America that millions of children play chess in Russia. That leads us to think of babies who are born holding chess pieces, chess clocks and have autographs of Mikhail Tal or Alexander Alekhine on their onesies. Have you played since you were a little girl or did it take a while for you to find out about the game? NP – As most grandmasters, I have learnt how to play chess at a relatively early age – at 5. Since 12 (after winning the Russian Championship) for the first time I started considering myself a chess semi-pro, and decided to become a chess professional a few years later. RX – Are there other good chess players in your family? Your parents or a brother (do you have any siblings?)? NP – My parents aren’t keen on chess, neither do I have siblings. RX – We ask that to know if you think having a family of chess players helps in the development of your game or if it gets in the way. Sometimes, competitiveness inside the family or even if one brother thinks the other one is a better player, it might be a little unexciting. Is the ‘Polgar Family’ an exception or do parents and siblings who play together usually enhance each other’s performances? NP – When two brothers or sisters start playing chess, usually one of them progresses much faster than the other, and the weaker player leaves the game. OF course, there are exceptions (e.g. Polgar or Kosintseva sisters), but they are quite rare. In terms of progress, having access to proper tournaments, coaching, chess friends is more important than a chess-playing relative. RX – You have recently had a kid, right? Do you think about how it will be to teach him to play chess, what will his first championships be like? Do you spend time thinking about that stuff? How can a parent’s will contribute and not become pressure in this situation? NP – While many people expect Nikolai to become a strong chess master, neither Peter nor I have any special chess expectations towards him. We will teach him how to play, but let him choose his occupation himself. There’s no need in trying to bring up a chess prodigy artificially. Who knows if he will be interested in chess at all? NP – To me Brazil is associated with sun, friendly people (I occasionally get to chat with chess fans from Brazil via Facebook and Twitter) and, of course, legendary soccer players! I have also published stats about Brazilian chess at my blog! RX – One thing we know, for instance, is that Russia is chess’ crib! You hear that in America all the time and it creates this illusion that, visiting St. Petersburg or Moscow, we’ll see kids playing chess on the streets, just like we see Brazilian kids playing soccer. However, to my surprise, a friend of mine who recently visited your country was a tad disappointed. He didn’t see lots of people playing chess on the streets and squares or specialized chess stores or busts of Karpov, Kasparov, Tahl, Botvinnik and Pogonina . Where do chess players hide in Russia? How is the basis of chess built there? RX – Is financial support really significant to evolve in the sport? NP – Financial support is critical, of course, since without it people aren’t motivated enough to take up on the sport, and are forced to leave it due to not being able to support a family. Luckily enough, although we don’t have the earnings of soccer or hockey stars, one can still make a living playing chess. RX – You are a woman (a beautiful one, by the way!) and knowing that we, at Radio Xadrez are supporters of the idea that man and women can compete in the same level, we still hear a lot of joking around about it. I’m sure you do also and that’s why we ask: do you prefer playing against women or man? NP – Thanks! It’s actually very hard for women to compete with men in chess (I have even written an article for ChessBase on this topic). Games against women are tenser, more emotional, thus there are more mistakes in them. Generally speaking, my schedule is mainly composed of top female events (like the World Championship, Chess Olympiad, Russian Superfinal, European Championship, etc. ), so I cherish the opportunity to face strong male players from time to time. That doesn’t happen often though. RX – Can you tell us a funny story about how it felt to beat a sexist man is one of your games? NP – Of course, I did beat some sexist men in my chess career, but didn’t have a chance to face the legendary Victor Korchnoi. He is known as the #1 insulter of women (who have either beaten him or drawn the game). RX – Brazilian girls complain that there are less female tournaments, less incentive. We have recently interviewed our #1, WFM Vanessa Feliciano, who said she prefers to play with man, because in female chess the psychological pressure is stronger. Do you agree? NP – It’s true: there are relatively few women’s events, the prizes are lower and so on. Also, to improve one needs to play against better opponents, and nowadays even the supertournaments among women can guarantee only about 2500 in average ELO of players, so one has to play men to improve beyond that stage. RX – Do you get more nervous standing in front of WGM Alexandra Kosteniuk or GM Magnus Carlsen? How do you feel about that? 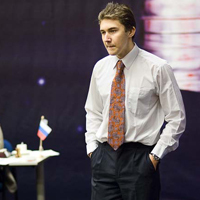 In the 2008 Chess Olympiad Sergey Karjakin played the 2nd board for Ukraine and narrowly lost a team medal in the final round. In the meantime, soon after winning the 2009 Corus tournament, Karjakin moved to Moscow and obtained Russian citizenship. At the 39th Chess Olympiad in Khanty-Mansiysk he is representing Russia. Being in excellent form, he is the striking force of the Russia 1 team, having collected 5.5 points from six games. In the 7th round his victory against Evgeny Tomashevsky was decisive for the positive result in the match against the very strong Russia 2 team. In round 8, Russia 1 is set to match Karjakin’s former country – Ukraine. Bellow is an interview given for the Olympiad official website. - Your game decided the match. Did you feel nervous? - This was probably the turning point of the game. Do you agree that Tomashevsky started looking uncomfortable after that? - Yes, your observation seems to be correct. He started blundering, and I used it well. - At the end when Tomashevsky was about to resign, you suddenly sunk into thought for a long time. - The game was too important, so I tried to calculate everything flawlessly. I didn’t want to spoil the effort. I developed a mating attack, but the material was even, and if Black defended, I’d have serious problems. - The first team won – is this a fair result? - I think so. You have to admit that our team is a little bit stronger. - Did you follow your teammates’ games? - Of course! I noticed that Grischuk and Svidler had better positions. Peter played very aggressively was close to a win, but Vitiugov managed to hold. - Have they congratulated you on this victory already? - Yes. We took two very important points. - Your former team, Ukraine, is leading after 7 rounds. Do you feel any regrets about changing the citizenship? - Not at all. I have excellent relations with the Ukrainian players, but I’ll forget about friendship tomorrow – this match may determine the Olympiad winner. It will be a great fight! And I hope Russia wins. - Are you sure that you’ll play in the match? - It will be decided before the match at the team meeting. But I am in an excellent form, I feel great and really want to play. - How do you like working with the best Russian grandmasters? - Everything is just fine. We support each other, and everybody is ready to share their ideas. I feel the integrity of the team. Working in such atmosphere is a great pleasure. - What can you say about the organization of the Olympiad? - Everything is superb. I was in Khanty-Mansiysk before, and the main problem was frosty weather. There is no such a problem now, so I cannot complain about anything. After the victory in the third round the players of the Russia-1 women’s team Tatiana Kosintseva, Nadezhda Kosintseva, Valentina Gunina and their coach Yuri Dokhoyan were invited to give the press-conference to the journalists of the Olympiad Press Center and the next day they defeated Georgian team in the next round. – Yury, are you satisfied with your team’s performance at the start of the tournament? Yury Dokhoyan: Today’s game against national team of Slovakia was good; we had a lasting pressure on three boards at the same time right from the beginning. Tatiana and Nadezhda were playing rather confidently, Sasha Kosteniuk won a good game and Valentina, taking into account the result of the team, decided to make a draw to secure the overall victory in the 3rd round. In the 2nd round we committed a mistake, but in general I am satisfied with their play. In any case the games against major opponents are ahead. – Who are the main opponents in the fight for the gold medals? Yury Dokhoyan: They are placed strictly according to the Rating: Ukraine, China and Georgia. They are strong teams that have won high-level tournaments many times. – Everyone is expecting only one result from Russia-1 team – the 1st place. Tatiana, playing on the 1st board, do you feel the responsibility for the final result? Tatiana Kosintseva: Of course, I do, that’s why I will try to do my best in each round. However, it has nothing to do with the fact that I am playing on the 1st board here because I had to be the 1st board before and I have some experience in managing my emotions. – Russian women’s national team is also remarkable for the fact that the Women’s World Champion is playing at the 3rd board. Is it a strategic decision? Yury Dokhoyan: The board composition of the team is made according to the sport principle and to the Rating. I was ready to make an exception for the Women’s World Champion. She had the right to play on the 1st board and I suggested that to her. She chose the 3rd one, explaining it by the lack of practice. She decided that it would be better for the team, and eventually, her arguments convinced me. But in general, I believe that the World Champion in general is the one who can lead the team and represent it at the high level. He is there for that purpose. – Now you are the coach of the sisters and you used to be the second of Garry Kasparov. With whom is it more interesting to work? Yury Dokhoyan: They often ask me this questions. Till 2005 when Garry Kimovich gave up chess, I was his principal coach. Then our paths were separated – I started helping Tatiana and Nadezhda, what subsequently made me the Women’s national team’s coach. Now Tatiana and Nadezhda perform at the level of a strong Grandmaster and training them became very interesting. Moreover we are speaking of training the national team’s players. – Nadezhda, have you ever argued with your sister for the board? Nadezhda Kosintseva: I haven’t had any serious reasons to push my sister in a lower position. There was a moment when my rating was slightly higher than Tanya’s, but there were not any team competitions and I didn’t have chance to use this advantage. I just was not lucky (laughing). Т.К. : Indeed, in classical chess our games are resulted without any serous fight. I do not think that I have to explain the reason for that. Sisters are not supposed to argue. As for the Blitz tournament, we have agreed with Nadya right away that we will play seriously. Here is a paradox: we scored the same anyway. I want to underline that I like the idea of such tournaments itself, because women chess players do not have enough opportunities to play in the competitions on such elite level like Wejk-an-Zee, Bilbao and Linares. We have only FIDE Grand Prix and I am very happy about the fact that now we have the competitions of such scale where we can try ourselves out. I hope that it will remain traditional in the future. – What are your relations out of chess? Т.К. : .Very good. It happens that we quarrel but we always try to come to a diplomatic decision of the conflict. N.К. : Yes,we prefer to sort things out in a blitz. We play very tense matches at home, it happens that games last for hours and no one is ready to give up till the end. We do not find compromises in this case. – Tatiana, was this year successful for you? Т.К. : It is too early to speak about the results; the year is not finished yet. There are so many tournaments ahead of us and so far I am happy to have played in “Grand Prix” series where I performed very well and gained experience. – Nadezhda, do you feel tired? N.К. : No, I don’t. The thing is that from tournament to another the game becomes more tense. Olympiad is a very serious tournament and moreover it is taking place in our own country. It is possible that teams who are not favorites show the best results. That is why one has to be always in a very good shape and I hope that we will continue playing better and cope with stress. – Girls, could you tell us about your holidays? N.К. : Before the Olympiad we had a chance to go to Anapa to have some rest, enjoy the sea and get suntanned. We need it very much, moreover before that we played a very long series of tournaments. We got very tired and this trip let us regain strength before the Olympiad. V.G. : I also went to the seaside to Tunis. I am in the 5th year of the university and soon I will be getting a diploma, therefore I will hardly have time to rest in the nearest future. – Valentina, I see a toy on your knees .Who is this? – Does it have a name? This is Tigger from “Winnie the Pooh” cartoon. – And do the sisters have their talisman? N.К. : Unfortunately not. We are good friends with Valya’s Tiger. More on the official website. In the 4th round the leader of the Georgian national team Baadur Jobava defeated the world number one Magnus Carlsen. After the match Baadur Jobava and his captain Tamaz Georgadze shared their impressions from the Olympiad and answered other questions for the official website. - Tamaz, did you expect that Baadur beats Carlsen? Tamaz Georgazde: When Baadur is in good shape and mood, he can beat anyone, and I know it. Before the game I suggested to play more accurately – after all, he is playing against Carlsen, and suffered a loss in the previous round. However, you can’t argue with Jobava – even in a drawn position he always looks for an attack! Today he managed to find several excellent moves in approximately even position, and the opponent was unable to find proper countermeasures. After that, Baadur was basically freerolling. - Baadur, did you expect to beat Magnus, who usually loses just one or two games a year? Baadur Jobava: After I lost to the Mexican player in the previous round, I had very aggressive intentions, although I did my best not to reveal them to my teammates. I played accurately, choosing a safe position where one can always go for a draw. At some point Carlsen overestimated his chances and started playing sharply for a win. Then he missed a couple of important replies and was unable to recover. Generally, I am happy! An opportunity to play the world number one does not come too often, not to mention beating him! - Were you afraid of Carlsen? Did you know his weaknesses? Baadur Jobava: Before this game our score was equal – we made two draws and won once each. However, our last meeting occurred in 2005, and it is obvious that Magnus made a huge progress since that time. As for the weaknesses, even computer has them, but discovering them overnight is a tough job, especially if you consider Carlsen’s versatility. So I just played chess. T. G.: We are ready to play against anyone, and fear no one. I promise there will be a big fight, and may the strongest win. - Baadur, the first board competition is very tough. You will face Aronian, Kramnik, Ivanchuk… Do you fear any of these people? Baadur Jobava: I have never been afraid to play stronger and more experienced opponents. Maybe it helped me to become a professional player. Now I have experience too. You should never play scared! - Were there any changes in your life since your last visit to Khanty-Mansiysk? – Which result will be considered successful for your team? Hao Wang: It will be difficult to compete with such teams as Russia and Ukraine. We should be satisfied with winning the medals of any kind. – And the women’s team obviously aims for the gold? Hao Wang: Oh yes, no doubt about that. And we will support them as much as we can. – Li, how many years do you play chess? Li Wengliang (team captain): 30 years already. And I am a captain of the national team for about 10 years. – What kind of souvenirs will you take home to your family and friends? Li Wengliang: I will definitely bring chess and chess books, especially those in Russian. – Did you have any worries about traveling to Siberia? This land is famous for its frosty weather. Li Wengliang: The climate in my native province of China is very similar, so I don’t mind. – What do you think about Khanty­-Mansiysk? Li Wengliang: I live in Beijing, and the air here is much cleaner than in my city. Also Russian people are wonderful and very friendly. In addition, I admire Russian culture! - Anna, your sister is 18 today. DO you have a surprise for her? - I have not seen her yet today but of course I have prepared a present for her in advance I think we shall meet during the game. And in the evening we will try to celebrate her birthday with our teams and friends. – Is it often the case that you celebrate your birthdays away from home? - It happens. Professional chess players play a lot. - Being an elder sister do you take care of Mariya? - Usually we stay together. And this time it turned out that we are accommodated in different hotels. We play for different teams. She plays for Ukraine and I represent the team of Slovenia. - Is your sister one of the youngest in the Ukrainian team? - Have you called her the first at midnight to congratulate on her birthday? - No, I have not. I called her in the morning. We follow the regime. It is not professional to wake her up at midnight before the tournament even for the sake of her birthday. - Where did you meet your 18th birthday yourself? - Have you thought of something special for your sister today? - We will try to celebrate her birthday so that she likes it. Of course we shall not make a big party, we will get together only with the closest friends. There is another problem-we have just checked in and we have no idea who is placed where. Someone will be able to come and some not. I know that her team will be there. - Will there be any birthday cake with candles served for her? - We always have it at home. Here everything is more complicated. I do not know yet, maybe I will take care of it. - You can always buy candles in the next-door shop. - What can you tell us about your sister in one word? - What did you wish her when called her in the morning? - I wished her good luck and so that all her dreams come true. Theodoros Tsorbatzoglou, individual candidate for board member at the ECU elections, presented his future program in a talk with Chessdom.com. He is coming with direct solutions how to enhance the popularity and professionalism of the European Chess Union, with true understanding about the European chess player needs, and with direct ideas how to bring chess closer to the Olympic family. ECU elections will take place in Khanty Mansiysk during the World Chess Olympiad 2010. What is the main point of your candidacy as individual board member? I believe that ECU is an organization which is developing step by step and is trying to find its placement in the sports market, thus it should be guided by a long term marketing plan. Following hard and professional work by the board members, The sports’ sponsors will come to invest in chess only after we can ensure them that ECU is backed by hardworking and professional team, which can ensure additional value and benefit for their products and businesses – both socially and financially. I don’t believe in the money which is coming suddenly from the sky. As an International Sports Organization we have both social and commercial mission and we are obliged to check the source and the motives of the all resources. It is important to keep our values and enhance the promotion of the great educational assets of our sport. What are the member federations awaiting from the next ECU board? I can tell you what the chess member federations are not awaiting from the ECU after the elections during the World Chess Olympiad in Khanty Mansiysk. First of all ECU Board is not meant for traveling, sightseeing, and delicious dinners. The members should be there to invest their energy, fantasy, new ideas, and fair decisions. Second, any elected member cannot have any professional position, or have current position in FIDE or National Federations that could be contradictory to his ECU position. For example elected members during their term cannot be arbiters in ECU events, cannot bid for ECU events, cannot compete professionally, and should not be managers of players because they represent all players. I am coming with this proposal to Ganeral Assembly and I will ask from the twenty two candidates to sign it as memorandum before the elections! This way we can make a clear start and work on new statutes of the ECU. So your candidacy is coming with multiple ideas. What are the first things you will propose to Board if you are be elected? Being so many years part of professional sports organizations and having seen all levels of the market, there are indeed multiple ideas that need to be employed. However, some of them are of great importance and should be a fact as soon as possible. A. Guidelines for all of our actions. We must stop deciding according political pressures, according to who is our friend. If we want to build a serious administration we should describe what our needs are and follow them strictly. This is how ECU should be a respectful organization, based not om personal relations, but ideas and professionalism. B. Special rules and guidelines against Nationalism and Racism. Such appear in all professional Sports Federations and we have to act accordingly. C. Change of statutes describing the incompatibility functions for ECU Board members (as explained earlier). D. Signing of agreement with a major Sports Fashion Company. The dress code in major chess events will bring us closer to the Olympic family. Moreover, it will bring additional income for organizations and top players. I have already made the first talks with companies and am ready to present them. E. Co-operation with GREENPEACE and WWF. Environmental policy becomes a major issue in the modern world. My proposal is in all ECU youth events to be an environmental presentation for the young people, thus contributing to the development of a environmental responsibility. I have done first steps on this during a recent chess event in Thessaloniki. Read a recent article about ECU in focus by Theodoros Tsorbatzoglou here. You mentioned several necesities for chess to be part of Olympic Games. Do you see this in the future? The biggest bet for chess are the Olympic Games. However, the key are the Winter Olympic Games! Their popularity is 20% compared to the Summer Olympic Games, yet the games are equally important in the Olympic family. Imagine what will be the results for countries like India and China (for example) if Chess enters the Winter Olympics – their popularity will be doubled and the games will have television rights access in a larger spectrum of countries. This should be elaborated in a case study of the Marketing Department of the seven main Olympic Sponsors. ECU is an organization depending on the global processes in Europe. How you see the general situation in the continent? Let’s be honest, Europe is in a deep financial crisis, but even more in a social crisis. There is disappointment around with the politics and the insecurity for the future. I have always been a supporter a united and federal Europe – from Gibraltar to the Urals. A Europe with a central policy which will focuses on the needs of the people and the countries, just the one ECU should also apply. How will FIDE elections effect the ECU elections? FIDE is the main international chess sports organization and the elections in FIDE affect all the Chess World. It is normal everybody to have his opinion or to declare his support to candidates or programs. We have ECU elections, yet many people mix both and support the one or the other candidate for FIDE. What I want to say is that to be a supporter is not a positive administration qualification for a future ECU Board member. ECU need leaders and decision makers, not followers and clappers. Why should the delegates to vote for you? I have performed all the main chess and sports management roles. Having participated in sports administration (in chess, volleyball, basketball) gives me a wider picture of a sports market and a deeper view on how chess should be placed in a competitive and demanding environment. My experience in European Union projects (one part of my professional activities) gave me the opportunity to understand better the European history, culture, and local characteristics. I would also add that for me there are no west or east (politically) chess players, there are no big or small countries. In my eyes there are people with the same needs, dreams, equal rights, sharing their love for chess and life. Back in February (2010), I was approached by Mr. Michael Khodarkovsky who is the President of the Kasparov Chess Foundation and a U.S. Chess Federation’s FIDE Delegate. At that time, Michael Khodarkovsky informed me that GM Ron Henley wanted to talk to me about GM Anatoly Karpov running for FIDE President. He told me that Mr. Henley also asked for a meeting with him. I mentioned to Michael Khodarkovsky that I could not meet with Mr. Henley at the time, but maybe later. Early in March, I agreed to meet with Mr. Henley since I have known GM Henley for a long time and I always thought he was a nice person. The same week, I received a letter from FIDE President, Kirsan Ilyumzhinov inviting me to be part of his electoral ticket. When I meet with Mr. Henley, he offered to appoint me as FIDE Vice President in Mr. Karpov’s Presidential Board and compensation for actively campaigning. After carefully reviewing the situation, I considered that FIDE President Kirsan Ilyumzhinov was the best candidate as FIDE President, and I was highly supportive of his team as well. I did not think that Former World Champions Anatoly Karpov and Garry Kasparov, both great players and important members of our community, were the best people to run FIDE. In the past they were both chess enemies, and I considered how this could create potential issues between them, in case that GM Anatoly Karpov became FIDE President. I also thought, that their motivations were not in the best interest of FIDE and GM Karpov was lacking the necessary experience to run an organization such as FIDE. Something just didn’t quite fit or feel right about this situation and I held firm in this belief. Additionally, I also did not wish to divide the Americas, since we have been working for 10 years in building a block in the American Continents. During this time it also became clear that the Karpov team was going to try to split the continent by dividing the Americas in hopes of gaining ground in that region. My vision is for a united chess community, which is best represented by Mr. Ilyumzhinov’s Ticket and his team. Once I made the decision, I asked the U.S. Chess Federation’s Executive Board for a meeting, innocently I also included Michael Khodarkovsky as FIDE Delegate to join us in a conference call. At the conference call, all members of the board (5) were present: President, Jim Berry; Vice President, Ruth Haring; VP of Finances, Randy Bauer; Members at Large, Michael Atkins and Bill Goichberg. Mr. Goichberg is a former U.S. Chess Federation President and the main tournament organizer in the United States. Mr. Goichberg is very anti-FIDE and especially very anti-Kirsan Ilyumzhinov. I presented the situation to the Executive Board, Mr. Bauer got disconnected from the conference call, so he did not hear everything and did not vote. However, the Board took an unofficial vote. Mr. Berry and Ms. Haring voted ‘Yes’ to endorse me as a candidate in Mr. Ilyumzhinov’s ticket, Mr. Atkin said that he did not know enough, but was initially agreeable to support me, but decided to abstain, and Mr. Goichberg voted ‘No’ to my endorsement. Acting on Mr. Khodarkovsky’s advice the Board postponed the meeting for two days later. At the time, I did not know that Mr. Kasparov was the person running the campaign for Mr. Karpov and Mr. Khodarkovsky clearly had a conflict of interest, since he works for the Kasparov Chess Foundation and he is also serving as USA FIDE Delegate. During those two days, Grandmaster Kasparov and Grandmaster Henley made several phone calls asking the Board members not to endorse me in order to prevent me from joining Kirsan’s ticket and to only support Mr. Karpov. He even called a very influential person in U.S. Chess, who is also a major sponsor of the U.S. Chess Federation. This whole situation reminded me of the 1994 Presidential FIDE Election, when the U.S. FIDE Delegate was Mr. Fan Adams and in a meeting held prior to the Chess Congress in Moscow, the U.S. Chess Federation decided to support the candidacy of Mr. Kouatly, but then after GM Kasparov’s phone calls to members of the U.S. Chess Federation’s Board, the United States changed their position at the last minute in favor of FIDE President Mr. Campomanes, resulting in the resignation of Mr. Adams. Back then, many promises were made but nothing happen in the end. Now, back to March, 2010, two days after we had a conference call, we met again over the phone with the members of the Federation’s Executive Board, Mr. Khodarkovsky and GM Henley. Karpov’s team made a new offer to me in exchange for me not accepting Kirsan Ilyumzhinov’s invitation to be a member of his electoral ticket. The offer was an appointment in GM Karpov’s Presidential Board (in the event that he won the election) and full support to become Continental President. In addition they would not require that I campaign on behalf of Mr. Karpov. I told them that I would not accept the offer. One hour later, Bill Hall, USCF Executive Director and Ms. Haring called me to tell me that I should accept the offer or else they would not endorse me and that they would even remove me as Zonal President. By then it became clear that I was dealing with a very undemocratic organization, and the way in which they were pressuring me and trying to force me to accept Karpov’s offer by use of threats, convinced me more than ever that I was making the right decision. I did not accept the offer, the board did not remove me as Zonal President, but the U.S. Chess Federation sent me a letter denying me the endorsement and making a statement that they would not support anyone who is on Mr. Ilyumzhinov’s ticket. Fortunately, the National Federations of Chile and Brazil gave me an endorsement since I am also a member of these Federations. From a very early age I came to the realization that I wanted chess to be a very important part of my life and have since dedicated my life to chess for the past 33 years. From the beginning I knew that the opportunities for chess players, especially women in chess were extremely limited. For this reason, I have dedicated most of my life to the development and promotion of chess, acting in different capacities. I was born in Chile and have resided in the USA for about 20 years. I love both countries, but consider myself a citizen of the world. My chess career began in 1979 when I started playing chess at Club Chile in the city of Santiago. The first time I won the Chilean Women’s Championship was in 1981, and I won this championship every year from 1984-1989. Although, my home Federation is the United States, I have strong ties to Chile, and I remain an active member of the Chilean chess community, as well as other Nations in the American Continent (from Canada to Chile) where in my capacity as the General Secretary of FIDE America, I have the opportunity to assist in many of the chess activities taking place in this part of the world. Most of my involvement in U.S. Chess has been as a chess promoter, scholastic chess and in leadership roles. I have been instrumental in the development of scholastic chess in the United States, and I worked for the U.S. 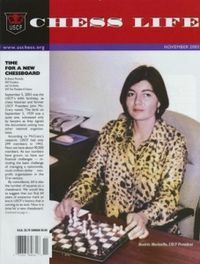 Chess Federation from 1997-2000 as a National Scholastic Director. Eventually, I became President of the U.S. Chess Federation (2003-2005), and I have been a member and currently Co-Chair of the Scholastic Chess Council . Currently, I am the Zonal President of Zone 2.1. (USA). In 2008, I was awarded Chess Educator of the Year (UTD), where I also received acknowledgement for my dedication to chess and education. I focused on “chess and the development of social skills for at-risk-children”, which I strongly believe in and is a primary concern for me as I promote chess in the global chess community. As I mentioned, I had offers to collaborate with both candidates for FIDE President. I have great respect for the top players, especially our former World Champions. I hoped from the beginning that these campaigns would concentrate on presenting the best programs and that they would focus on their contributions for chess development and promotion stressing their position on what each candidate and team could offer. I do not believe in negative campaigning, and although I am very disappointed with my home federation (USA) for not supporting me, I will not attack or do anything that can damage the U.S. Chess Federation or any other chess organization for that matter. Resorting to such tactics is against the very thing we are trying to do in the “One World. One Vision.” campaign and it is against everything I have done to promote chess on a National and International level. I will not stoop to our opponents level by using the methods they have implemented from the beginning of this election which are harmful to the global chess community. I will simply tell my story as it occurred.